Just like a car, some scooters have suspension to soften your ride. When driving over bumps, cracks or uneven surfaces, suspension will absorb some of that impact. For those users with back problems or other physical challenges, suspension is a great option for a smoother ride. Typically, suspension comes standard on larger full-size and outdoor scooters. The only travel scooters with suspension are the Pride Go Go CTS 3-wheel and Pride Go Go CTS 4-wheel models. Most travel scooters have gray or black tires that won't leave marks on wood, laminate or tiled floors. These tires are called "non-scuff" tires. Most travel scooters come with solid tires. You never have to worry about a flat, but they don't provide the softest ride. 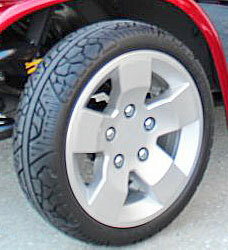 Manufacturers have also designed some black tires that won't scuff. Foam-filled tires - available on many of our non-travel scooters - are filled with foam instead of air so that you never have to worry about a flat tire. 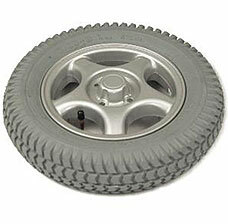 However, the foam still does not provide as smooth a ride as an air filled, or pneumatic, tire. 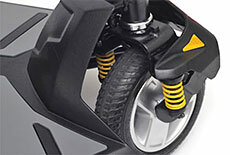 Full-size and All-Terrain scooters generally have pneumatic tires. If you plan on travelling over rough terrain, SpinLife suggests pneumatic tires; they provide shock absorption which produces a more comfortable ride. They do require some maintenance, and have a tube inside just like a bicycle tire. 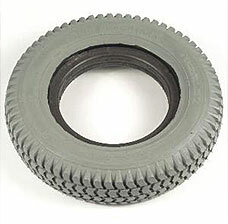 If your tire gets a flat, generally the tube must be replaced. You can investigate and choose tires when you order the model you want online. Look for the Details and Specs or Accessories tab.